The Hamilton-Fairfield Symphony is one of the finest regional orchestras in the Cincinnati area, not just for the quality of its performances, but for the creativity of its programming. Under music director John Paul Stanbery, the orchestra presents an annual American Masters concert. The series has spotlighted Ellen Taaffe Zwilich, Robert Ward and H. Owen Reed in the past. The music of Michael Daugherty was the centerpiece of the 2013 event Feb. 23 at New Life Vineyard Church in Hamilton. Daugherty was present for the concert, having spent the week in Hamilton “breathing the same air” and working with the orchestra (all composers on the series must be living Americans). 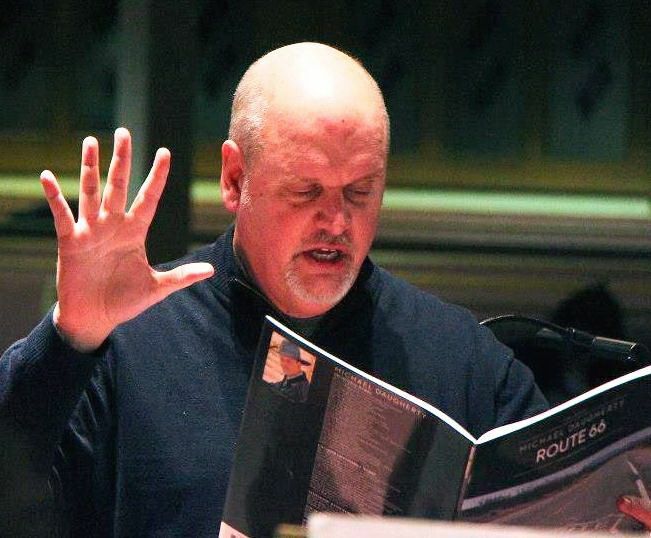 It was a red-white-and-blue program, featuring Daugherty’s 2010 Mount Rushmore for chorus and orchestra, his 1999 Route 66 and 2011 Lost Vegas. The achievement of the performers was inspiring, the content of the program, inspired. Each movement of Mount Rushmore is keyed to one of the monumental figures carved into the mountain. Daugherty assembled his texts from writings or letters by the subjects, and each movement contains pertinent musical references: “Yankee Doodle” and William Billings’ Revolutionary War anthem “Chester” for George Washington, the “Marseillaise” for “Thomas Jefferson”, “Rock of Ages” for “Theodore Roosevelt” (his favorite hymn) and “Dixie” and “Battle Hymn of the Republic” for “Abraham Lincoln”. “George Washington” draws from a letter to the Marquis de Lafayette in 1784, when Washington was contemplating retirement from public service (he had yet to serve two terms as the nation’s first president). Beginning with a fanfare, it is a majestic setting, with the orchestra and chorus – a formidable ensemble here, with the Hamilton-Fairfield Symphony Chorale, Mason Chorale and members of Voices of the Commonwealth -- enclosing a smaller “shape note choir.” It created a stirring effect, the eight-voice choir giving Billings’ anthem an uncanny period sound. The second movement, “Thomas Jefferson”, captured the “head” vs. “heart” complexity of America’s third president. It was a dramatic reading, with texts interwoven from a song written by a love interest in Paris (Maria Cosway), excerpts from Jefferson’s letters, including one expressing his passion for music, and quotes from the Declaration of Independence. “Theodore Roosevelt” was urgent and declamatory, built on extracts from his speeches celebrating America’s outdoor heritage and ending with the shout, “Leave it as it is!” The final movement, “Abraham Lincoln” comprises the Gettysburg Address. There were rousing climaxes (“all men are created equal”), striking use of dissonance (“We cannot dedicate, we cannot consecrate”) and a highly moving resolution (“we here highly resolve”). Led by Stanbery, the combined forces of the orchestra and massed choirs made a splendid impression, one that begs for an encore (perhaps on Presidents Day, 2014?). Members of the Great Miami Youth Symphony joined the adult orchestra in Daugherty’s popular “Route 66”. The venture was a trip, full of syncopation and jazz, ending with a big fadeout, like air leaking from a tire. Daugherty’s 2011 “Lost Vegas”, performed by the HFSO alone, was a kind of retrospective (hence the title), conjuring the 1960s-70s “neon” Vegas, the “Strip” and iconic entertainers like Frank Sinatra’s “Rat Pack.” It was a field day for percussion, with mallet instruments, temple blocks, bongos and just about everything within reach. The final movement, “Fever”, opened with a rumble of bass drum and principal bassist Bob Borden slapping the fingerboard of his bass for a touch of swing. The Winton Woods High School Varsity Ensemble, gold medalists at the 2012 World Choir Games held in July in Cincinnati, were showcased in Adolphus Hailstork’s “Wake Up My Spirit” and Moses Hogan’s arrangement of “Battle of Jericho”, led by Elizabeth Barth and David Bell, respectively (kudos to the singers for their staccato diction in the latter). Bell led the HFSO and the combined choirs in a heartwarming arrangement of “Shenandoah” by Mack Wilberg. True to its all-American focus, the concert opened with “The Star Spangled Banner” and the adult and youth orchestras led by Stanbery in a lovely reading of “Blue Ridge Legend” by Paul Whear. In short, it was a concert to shed luster on the Greater Cincinnati community (and beyond), and in highlighting Daugherty and his music, to foster appreciation of the finest in American music here and now.